Last May, President Obama brokered a deal with the Taliban for the release of U.S. Army Sergeant Bowe Bergdahl, who had been held captive in Afghanistan for five years. What should have been a triumphant, joyful return quickly became a major military and political controversy, as questions over whether Bergdahl had deliberately deserted his post began to circulate. In March, the Army charged Bergdahl with one count of desertion and one count of misbehavior before the enemy. Now, the second season of the podcast Serial is covering the case. And what Bergdahl has to say in the first episode is incredibly revealing. Serial has used 25 hours of taped conversations between Bergdahl and screenwriter Mark Boal, the screenwriter behind The Hurt Locker and Zero Dark Thirty. Boal was interviewing the sergeant as research for a movie he had planned to write. Through their conversations, Bergdahl tells his side of just what happened in Afghanistan. As a captive of the Taliban for five years — longer than any American has been held by the group — Bergdahl was subjected to some unimaginably horrific experiences. How do I explain to a person that just standing in an empty dark room hurts? The darkness dealt more than just physical anguish. There are times when I'd wake up and it's just so dark, I would wake up not even remembering what I was. You know that feeling you get when that word is on the tip of your tongue? That happened to me, only it was "What am I?" You're just standing there, screaming in your mind ... and just on the other side of that flimsy, little wooden door that you could probably easily rip off the hinges is the entire world out there. These dark rooms, of which Bergdahl told Boal there were several, are the reason he has a newfound aversion. "I hate doors now," he says. In Boal's first taped conversation with Bergdahl, the screenwriter asks him to give the 30-second version of his story. That's when he explains the crux of not only the episode, but Bergdahl's story. You know what DUSTWUN is, right? DUSTWUN is a military radio status which stands for "duty status — whereabouts unknown." It's used when a soldier goes missing in the field or is taken captive. According to Bergdahl, he was trying to prompt a DUSTWUN in order to call attention to an issue: leadership problems within his platoon. What I was seeing from my first unit all the way up into Afghanistan, all I was seeing was basically leadership failure, to the point where the lives of the guys standing next to me were literally ... in danger. Bergdahl tells Boal that he knew all along he might face jail time for his actions, and that it'd be worth it. I was fully confident that when somebody took a look at the situation ... that people would understand that I was right.... The idea was I'd rather be sitting in Leavenworth than standing over the body of [a fellow soldier]. 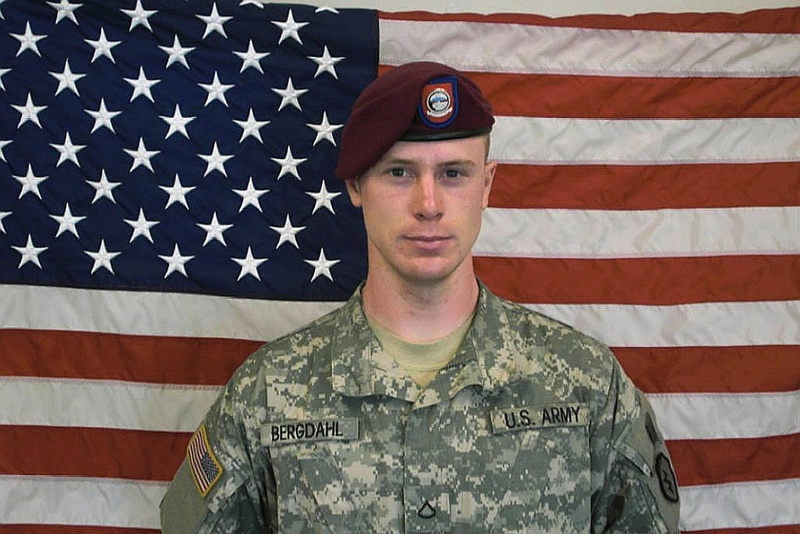 When Boal calls what he did a "gutsy move," Bergdahl responds, "Gutsy, but still stupid." I was trying to prove to myself, I was trying to prove to the world that anybody who used to know me that I was capable of being that person ... Doing what I did was me saying, "I am like, I don't know, Jason Bourne." Perhaps the most revealing portion of the first episode is when Bergdahl recounts the night he decided to carry out his plan, and the exact moment he realized that he had done something he couldn't take back. Twenty minutes after walking away from his post, he realized "I really did something serious." But still, he had a plan. He would give himself insurance against the consequences he would face from his platoon by obtaining crucial intel. The idea would have been if I had seen somebody in the darkness who looked like they were doing something suspicious [like planting an IED] I would then slowly, quietly follow them in the night, and in the morning pick up their trail and track them to wherever they were going. Then, I'd get that information so that when I got back to the F.O.B., they could say, "You left your position." And I could say, "I also got this information, so what are you gonna do?" That would have helped me deal with the whole hurricane of wrath that was gonna hit me once I got back to the F.O.B. But his mission didn't go according to plan. Bergdahl became lost in the desert overnight, and by morning, he was completely vulnerable. That's when a group of Taliban spotted him. There I was in the open desert, and I'm not about to outrun a bunch of motorcycles. I couldn't do anything against six or seven guys with AK-47s. These revelations not only set the foundation for the rest of the season by giving listeners crucial background information, but they also offer Bergdahl's side of the story to the public for the first time. For the last year and a half, he's been almost a chess piece in a larger game of diplomacy. Hearing him describe his experiences and what went through his head as he set things in motion, he starts to sound less like a deserter and more like a soldier trying to do the right thing — a man who was "gutsy but stupid."